WPZOOM is a professional WordPress development firm, specializing in themes and templates for the ever-popular WordPress CMS. Their professional team builds high quality, highly functional, sleek themes for business owners, bloggers, and webmasters alike. 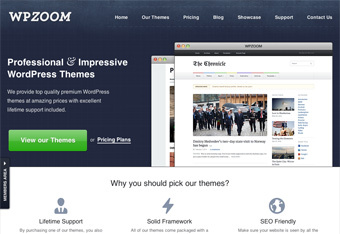 Unlike many of their competitors, WPZOOM offers full lifetime support on all of their themes. With a great selection of themes, the best support guarantee in the industry, and great prices, it’s no wonder that WPZOOM is drawing more and more customers away from the “big guys” in the industry.